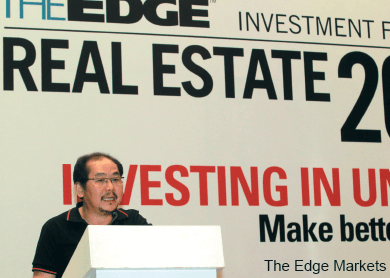 THE outlook for the property market for the next 12 to 24 months is likely to be negative, underpinned by increasing supply, affordability issues and less liquidity due to constrained bank financing, The Edge Media Group executive chairman Datuk Tong Kooi Ong said during his presentation titled “Democratising Property Investment” at The Edge Investment Forum on Real Estate 2015 on April 25. He noted that housing supply growth from 2002 to 2007 was over 6% per year, outpacing annual population growth of around 2%. “The large supply was absorbed by purchasers buying on cheap credit as banks redirected more loans to households from corporates following the Asian financial crisis. However, it also depressed prices and led to the build-up of household debt,” he said. Nevertheless, developers began to hold back their launches after the US subprime mortgage debacle in 2008/09, effectively halving supply for several years, said Tong. He said home prices have moved ahead of wage growth in the last few years. “There is little doubt that prices have risen sharply in the last five years. “This is especially true in urban areas, where growth has been strongest, while the middle class is seeing its disposable income curbed by higher inflation, rising costs and, now, the Goods and Services Tax. 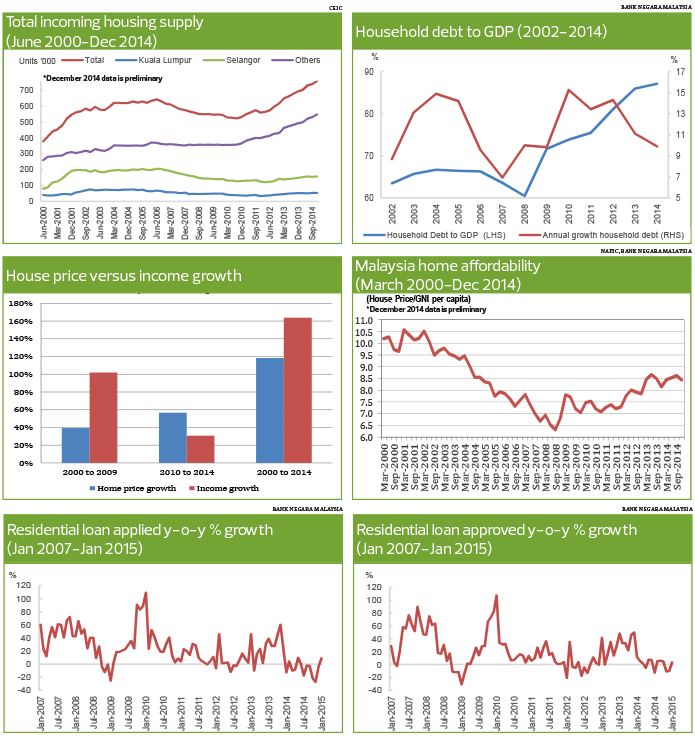 Meanwhile, affordability of housing is at about 8.4 years, the highest since mid-2005, but below the 10 years in 2000 to 2002, as Malaysia emerged from a recession. “The ratio since 2000 has been between 10.6 years in 2001 and 6.3 years in 2008. However, the urban-rural divide is very wide. 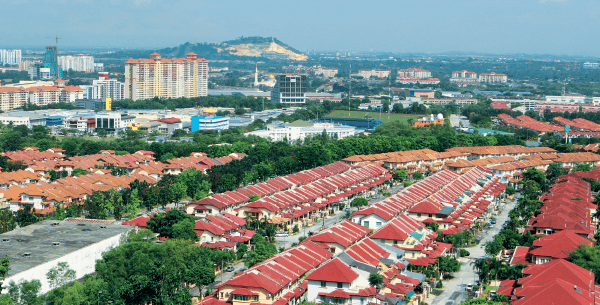 The average house price in the country was RM295,345 but the average for Kuala Lumpur was RM676,620 and Selangor, RM441,383. To buy a home in Kuala Lumpur, one has to earn 2.3 times more than the national average, and you will probably end up with a home half the size,” Tong said. 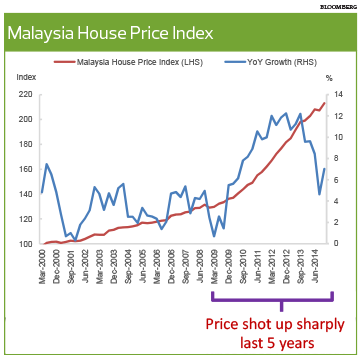 Despite these factors, he pointed out that there is no bubble in the property market and, therefore, it will not crash. However, when compared against longer-term trends, he said prices had lagged until the recent rally. “While the property market has been frothy since 2009, the period before that actually wasn’t. He said since 2000, the average home price has increased 118%, from RM135,293 to RM295,345, while income per capita rose 160%, from RM13,265 to RM35,002. “This means the price gain over the past five years was not ‘bubbly’, but more of a ‘catch-up’ process. And over the longer term, prices still slightly lag income growth but are close to an ‘equilibrium’ level. Conversely, it also means a crash is unlikely,” he said. However, there is a potential “wild card” that could reverse the market’s dampened sentiment, said Tong. “The one reason where we could be wrong and where we could instead see a faster reversal for a more positive property outlook is interest rates. Instead of rising domestic interest rates, it is now more likely that they will fall before the end of 2015,” he said. He said most countries are devaluing their currencies to boost economic growth through exports, which will lead to Malaysia reducing domestic interest rates to boost exports without a very negative effect on the ringgit. “If this happens, a lower mortgage rate, higher export earnings, more employment and higher wages will all be very positive for the property sector. To further promote economic growth, curbs on domestic borrowings and foreign purchasers will have to be relaxed,” he added. Despite a recovery on the horizon, Tong noted that it is more important to know how to look for opportunities. “The more important question is whether there are pockets of opportunities even as the outlook for the industry and the economy as a whole is negative. “When the tide rises, everyone gets lifted. But smart investors are the ones who are capable of finding the opportunities even as the tide recedes. Tong then unveiled theedgeproperty.com, which features the latest property news, property listings and free analytics that enable users to see popular locations with many transactions and assess the fair value of a property, among others. “theedgeproperty.com aims to teach you, to help you see the risks and find the gems. It makes prices and transactions more transparent and levels the playing field between the public and the professionals. It will help you analyse trends and market predictions. You will have a clear understanding of what is hot and what is not. And what’s selling in hot areas. At a glance, you should be able to see the environment, what facilities it has and so forth,” he said. Tong said property investment — while highly profitable over the longer term with potentially huge capital returns as investors use leverage or mortgages — requires longer-term forecasting because the market is less liquid compared with stocks and unit trusts. “If you buy on plan, construction will take years and you generally cannot sell until you have taken possession. The absolute amount is larger, the transaction costs are higher, more expensive and complicated. Mortgages take a long time to complete, repay or unwind. And you cannot easily sell when you want to. “Unlike stocks and unit trusts, the property market is also far less liquid. Finding buyers can often take weeks or months. Tong, citing an analysis by theedgeproperty.com of data from the National Property Information Centre, said the original owners of some 7,500 properties had lost out on additional profits of RM216 million — or RM29,000 per property — in 2013 by cashing out at prices that were lower. “So, do not be shortchanged. Similarly, what is the right price to offer for a property you are interested in? What was the price this seller bought for previously? This information will help you negotiate better,” he said. Into its ninth year, The Edge Investment Forum on Real Estate themed “Investing in uncertain times: Make better decisions” drew over 750 participants, comprising first-timers and seasoned investors. This article first appeared in City & Country, The Edge Malaysia Weekly, on May 4 - 10, 2015.